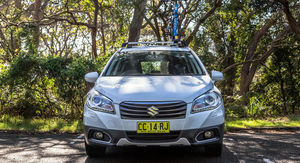 It was a busy couple of months for the Suzuki S-Cross GLX as a member of the CarAdvice long-term fleet. 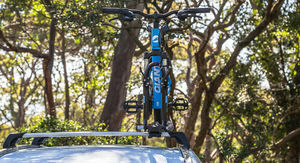 On the agenda was a mountain bike adventure with my daughter as well as a trip down the coast from Sydney to Kiama to meet pro-bodyboarder Lachlan Cramsie, who had spent few days with the Suzuki too. At the end of the first month, my initial impression was that the S-Cross was underpowered but well kitted-out and represented good value for money. Did that initial assessment change over the past couple of months? 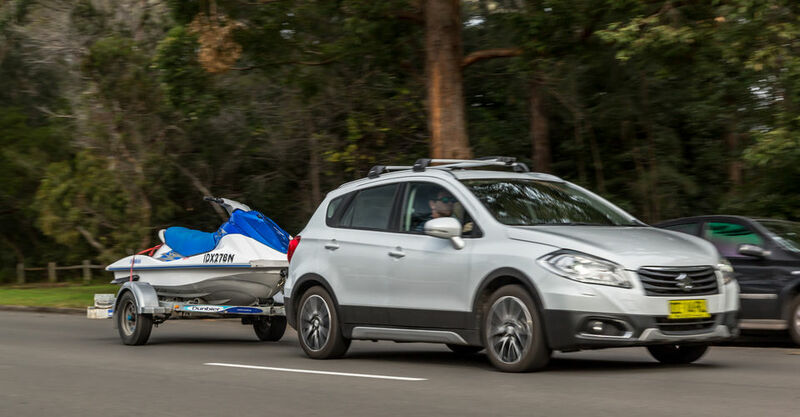 When it comes to practicality, the S-Cross has it in spades. 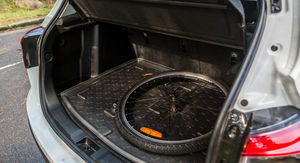 It’s comfortable enough to be a daily commuter and our test car had a couple of added extras that catered for weekend adventurers. 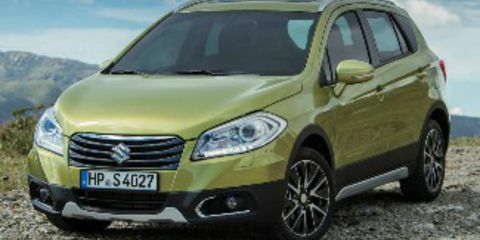 The overarching factor that has resonated throughout the entire duration of our exploration and discovery of every facet of the S-Cross, was its simplicity. 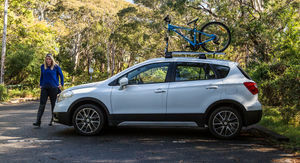 It’s simple to drive, simple to learn your way around, simple to use the extras (like the mountain bike carrier and tow ball), simple to park and simple to get people, luggage and adventure gear in and out. It’s almost perfectly uncomplicated and certainly suited to older drivers who appreciate easy ingress and egress, or even fledgling younger drivers itching to feel the wind beneath their wings and go exploring with their mates. Neither of those ends of the demographic would be likely to find themselves struggling to handle what’s under the bonnet, a 1.6-litre four-cylinder petrol engine with a continuously variable transmission (CVT) producing 86kW at 6000rpm and 156Nm at 4400rpm. I do say that in a non-condescending way, though. Personally I prefer something with a bit more get-up-and-go, however I’ve grown to appreciate the S-Cross for what it is. Even a young couple or a small family who don’t like the idea of launching off from the traffic lights, and who have no desire to join the ranks of those racing to get ahead of everyone else on the freeway, would appreciate this car and find it acceptable. 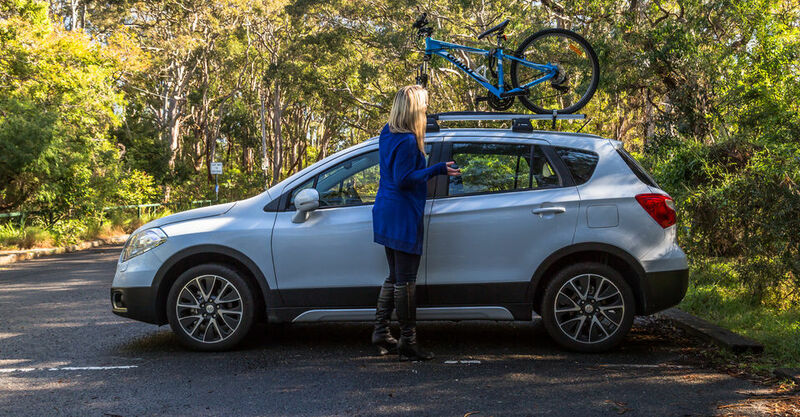 During my time fostering the S-Cross, I clocked up hundreds of kilometres driving to and from work and running household and family errands on the weekends. After a few days the underpowered engine would fade into the realm of being a non-issue, but then I would spend a night with something else from the CarAdvice garage and have to swallow my disappointment for the first five-minutes back behind the wheel of the S-Cross. But again, that feeling faded. 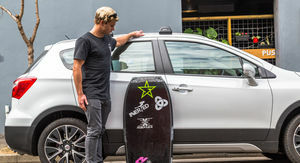 I parted ways with the S-Cross for a bit to get a fresh perspective from young pro-bodyboarder Lachlan Cramsie. Like most of his peers aged in their early 20’s, Lachlan is looking forward to being able to buy his first brand new car and owns an older second-hand vehicle. Long story short, he loved the S-Cross. 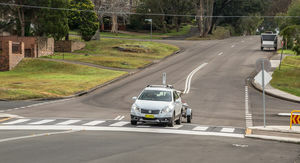 He lives in Kiama and travelled to Sydney to collect the test Suzuki. His ‘clunker’ doesn’t have satellite navigation and the fact that this features on the S-Cross earned it his first tick of approval. 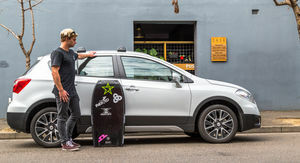 The S-Cross lived the life of this ambitious sportsman, up and down the coast looking for the best swell, having bodyboards chucked in and out of the boot, surfboards on the roof racks and mates climbing in and out of the back seat. Despite not having a lot of tech in his old Toyota Corolla, it didn’t take Lachlan long to get used to what’s available in the small SUV. 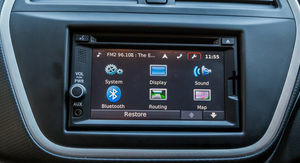 According to Lachlan it was quick and easy to pair his phone, and the Bluetooth audio streaming came in handy on trips, as did the cruise control. 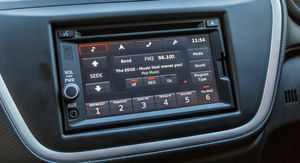 The touchscreen infotainment system was easy for him to navigate as well, although the one thing he didn’t figure out was the dual-zone climate control – he wondered why there were two controls for the air-conditioning. He liked the high seating position of the SUV, and he found it comfortable to drive. One of the highlights for him was the tow bar, given he moonlights as a lifeguard and needs to tow a personal water craft (PWC) at times. 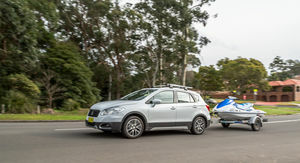 The S-Cross managed to tow the PWC without too many complaints, although he said that it still struggled up hills, but handled the added weight well. “I think it’s absolutely perfect. I haven’t driven a car like this for a very long time, if ever. I found out that something like this is really good; it’s perfect for the bodyboards in the back and you can even fold the seats down and chuck some surfboards in,” he said. Lachlan was reluctant to hand the keys back, but he has a world tour to qualify for and didn’t need to be distracted by shiny new toys for any longer. He clocked up 318km but here’s where things got terribly confusing. I had been scratching my head for months wondering why the fuel consumption was so much higher than claimed. 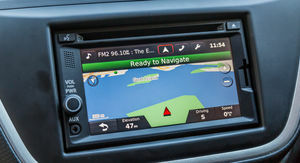 The figure shown on the digital display had consistently hovered between 13 and 14-litres/100km! It’s supposed to be somewhere around 5.8-litres/100km (though I was tipping it to work out to be around two-litres/100km north of this). Then the penny dropped (yes, go ahead and laugh all you want) the display was actually showing the figure for kilometres/litre – time to engage the maths part of the brain! After figuring out the formula and doing the calculation, Lachlan’s fuel consumption worked out to be around 8.1-litres/100km. That’s better. After the months I spent with the S-Cross, it was handed back to Suzuki with 13.5-litres/100km on the display, which worked out to 7.6-litres/100km – well within my predicted +2-litres figure. Kiama is quite a hilly area, so I blame that and Lachlan’s lead foot for his higher consumption. To answer a question on my last report, we used regular unleaded (91 RON) throughout the duration of the loan. I’m not a fan of the cold weather, so getting motivated to head out and do something to use the roof racks had been difficult. Finally, just before the time ended I loaded up my daughter’s mountain bike and took her out for the day. 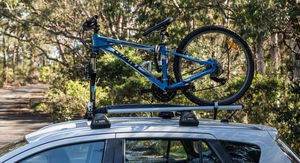 It was incredibly easy to use the bike rack that had been fitted to the roof racks, and the height of the car made it manageable for me on my own (if anyone knows of a teenager that willingly helps out with anything, I’d be surprised). 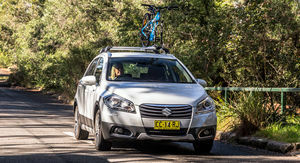 The S-Cross looks the business with its 17-inch polished alloy wheels, fog lights, HID headlights, roof racks and bike mount. Priced at $29,990 before on-road costs, with the additional equipment (tow bar kit $486, roof racks $433, bike carrier $298 and cargo tray $103) the total comes to $31,310 before dealer costs to fit the options. 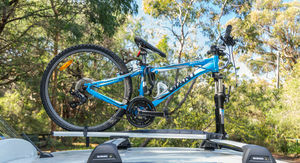 It’s well equipped for the price and the space has been well utilised when it comes to storage. As anyone with kids will know, they never go anywhere empty handed. In the front there are bottle holders in the doors alongside a small pocket, both quickly filled with Powerade and my daughter’s mobile phone. The centre console bin is square shaped and is nice and deep, with a USB port to charge devices or stream music. I claimed that space for my wallet and phone. The glovebox is a pretty average size, but there is a sunglasses holder in the roof above the rear-vision mirror. Below the centre console controls there are two cup holders, and a deep storage nook with a 12V outlet. 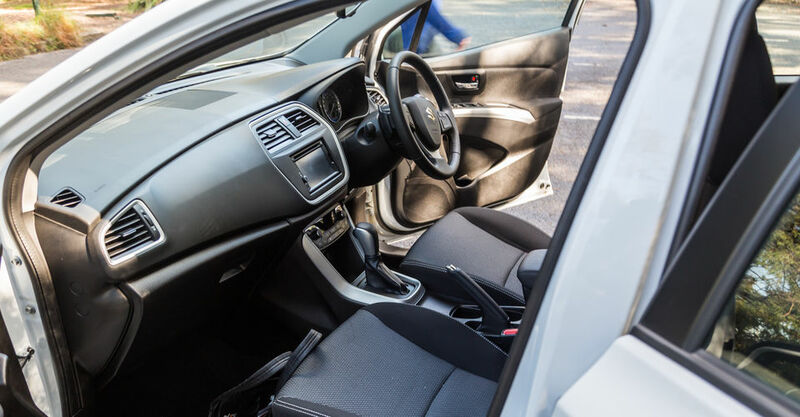 In the rear there are bottle holders in the doors, a map pocket behind the front passenger seat, two cup holders in the fold down armrest and ISOFIX points on both outside seats. What it misses out on is rear air vents and map lights. Heading out of town, I realised the steering wheel controls were now well and truly second nature. I was using cruise control, changing the radio volume and answering the phone without thinking. Behind the steering wheel are paddle shifters for manual mode, though I didn’t feel the urge to use these much. When you expect sporty performance along with your shifts, the S-Cross makes it a bit of a non-event, so I found it far more comfortable just to cruise along and let the transmission do its thing. 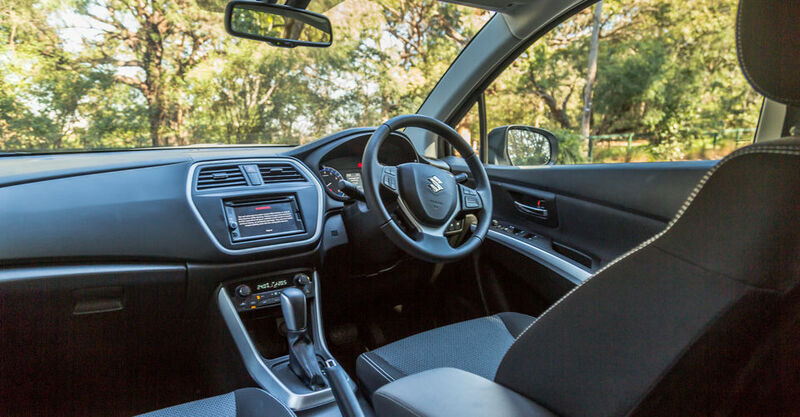 Though the interior looks a little dated with fake carbon fibre on the dash and chrome accents, the seats are comfortable with grey trim cloth fabric and white stitching. The fact that this front-wheel-drive has a proper hand brake and not a foot brake or electric park break is a bonus in my books, as that’s the type of old school I like. The S-Cross GLX grew on me over the course of my time with it. Sure it lacks a bit of conviction heading up hills and from a standstill, but it does the job it’s supposed to do and maintains composure around corners. Visibility is good, it’s easy to manoeuvre around and parking is a breeze thanks to the rear view camera and sensors. 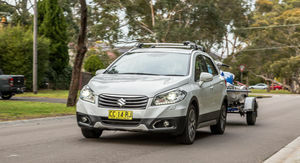 Though it’s not one of the best-selling small SUVs – competing with the likes of the Mitsubishi ASX, Mazda CX-3, Nissan Qashqai, Honda HR-V, Subaru XV and the run-out Hyundai ix35 – if you’re cross-shopping within this segment the Suzuki S-Cross is worth a second look. It’s calm and simple way may be just what you’re looking for. The S-Cross was returned before the weather started warming up, and it was a little sad to see it go. I think a paddle board would have looked great on the roof racks.